Thank you for your interest in promoting the “Fiction Plots Subscription” program. NaNoWriMo is in November every calendar year. “National Novel Writing Month,” for those of you who don’t know, is an annual challenge that helps people for free to commit themselves to writing a novel during the month of November. I try to update the sales pages on this website every year in October or November, so that affiliates can synchronize their promotions of this offer with the NaNoWriMo Challenge. What distinguishes the FictionPlots.com Subscription program is that it is a membership program that focuses on Fiction Plots, written in Series Format, with plot sets ranging from 2 stories to 20 stories in the series. OVERVIEW: This is the essence of your story and sums up what it is about in two sentences or less. SHORT SUMMARY: This section describes in greater detail the basic storyline. CHARACTER LIST: A list of the main characters (protagonist, antagonist, etc.). CORE CONFLICTS: The core conflicts your characters face. STAKES: What your characters stand to lose, and what is at stake for them. 10 CHAPTER OUTLINE: A step-by-step breakdown of each chapter with a short summary detailing what each chapter includes. as a “Lifetime” “price” or “access” or anything similar. this type of verbiage is now prohibited online. Affiliates will be paid 50% on the entire sales funnel. Affiliate Sign Up – Be sure to tell me how you want to promote, if you expect to be approved. If I know you, no worries. If I know you, ask for Review Access to this website, by contacting Bill Platt. The “Platinum Subscription” membership option is a one-time purchase. When someone buys this option, they will have access to all of the materials in the website for so long as the website continues to operate. The reason why the FTC has cracked down of the use of the verbiage “lifetime” is because it is unclear whose lifetime it represents. And that is a viable reason not to use this kind of language in our offers. This website was originally created in Nov 2014. We have continued adding fresh content to this website for most of that time. Although there was a drop-off in production in 2018, we started producing new plots in October of 2018. I have just cleared my finances to ensure that I will be able to maintain production going forward. There is a limited time $250 OFF Coupon for the “Platinum Subscription” membership option. The coupon code is “nov2018” without the quotes. This coupon code will expire on December 3rd, 2018, at midnight PST. This is a strong offer and it has been since this website’s foundation in November 2014. 246 people have so far purchased the “Platinum Subscription.” This option was only available to the public from Nov 2014 to Dec 2015 at a lower price, then it was brought back in October of 2018 at its current price. Affiliates have so far been paid $33,051 on the entire sales funnel. This program is attractive to anyone who struggles with writing fiction or wants to save time by focusing their efforts on the storytelling. Many fiction writers know that they want to tell fun and interesting stories, but they literally have no idea where to begin. The hardest part it seems is that first step – deciding what story they are going to want to tell. With this program, they can decide what genre they would like to tell their stories, then they can start reading the plots we have available. Once they have decided on the story they want to tell, they can and should adapt the plots we give them – changing the names of characters and places in the settings, so they can tell a unique version of the story concept we have given to them. One lady extracted plot #6 from a 10-plot series, then she turned that single story into a series of 6 books. One guy hires ghost writers to write stories for him. He writes stories in the Clean Romance genre, but he typically uses plots he finds in the Contemporary Romance and Mystery genres to work as the foundation for the stories his ghost writers create for him. One lady selected 5 plots in a series of 8 plots, then she built her own book series using the plots that she most enjoyed reading. One lady takes Contemporary Romance plots and converts them to Historical Romance stories. Another converts Historical Romance plots to Fantasy stories. Still another takes Fantasy plots and changes them up so that she can tell Science Fiction stories. One lady found her favorite series of fiction plots, and she took the characters from her existing book series and dropped them into the plots that she had gotten from our website. There is another fellow who takes the plots exactly as he finds them on our website, copies them to a Word Doc, then prepares them for his ghost writers. Once he copies the plot to a Word Doc, he does “Find & Replace” to change the names of the characters, then he sends the plot directly to his ghost writers who write the stories he sells. Many folks just pick a plot series they like, then they start writing a book based on the first plot in the series. After releasing the first book, they take the second plot in the same series and start writing. Many people find that each of our plots are perfect just the way they are, and they use the general outline as we gave it to them to create their own books. Do You Struggle With What Fiction Stories You Want To Tell? Best fiction plot deal on the entire Internet! Bill is absolutely brilliant to bring this offer to life. Use the coupon “nov2018″ (without the quotes) before the end of business on Dec 3rd 2018, to get another 25% OFF the already incredible one-time payment price for the “Platinum Subscription” deal. Most fiction writers struggle with picking out story ideas and outlining their books. How much more productive do you think you would be if you had access to a huge library of pre-written fiction plots, created by published fiction book authors, written in a series format, and laid out in a way that would ensure you had an extraordinary supply of story ideas with a ten-chapter roadmap for writing each of those stories? How inspirational do you think it might be if you had access to over 300 full-length fiction plots in 70 different series, in 24 different sub-genres, to guide your work? Bill Platt’s “Fiction Plots” program offers four different subscription options, including: Monthly, Quarterly, Yearly and his “Platinum Subscription” plan that allows you to pay a one-time payment to give you unlimited access to the plots already available and those plots that will be added in the future. Should you decide to purchase the “Platinum Subscription” plan, I have a coupon that will get you a 25% discount on the purchase of that option. The coupon is “nov2018″ without the quotes. This coupon will expire on Dec 3rd, 2018. If you struggle to decide on the fiction stories you will want to tell, then Bill Platt’s “Fiction Plots” program will be an incredibly awesome resource for you to use. It contains an extensive library of fiction plots, in a variety of genres, to help you discover new story ideas and to give you a solid roadmap to follow when writing your stories. This program currently contains over 300 full-length plots in 70 different series, in 24 different sub-genres. The other unique aspect of this program is that not only is the website chock-full of full-length fiction plots created by published fiction authors, but most of the plots are written in a series format to help you develop a series of books with the same set of characters. Bill offers four different subscription options, including: Monthly, Quarterly, Yearly and his “Platinum Subscription” plan that allows you to pay a one-time payment to give you unlimited access to the plots already available and those plots that will be added in the future. Should you decide to purchase the “Platinum Subscription” plan, I have a coupon that will get you a 25% discount on the purchase of that option. The coupon is “nov2018″ without the quotes. The coupon is only good until Dec 3rd, 2018. A lot of writers are struggling to come up with a story to tell in their next fiction novel, where the writer will be confident with the story idea and the story structure. A lot of writers will turn to websites like TV Tropes to mine for story ideas. However, given the way the website is laid out, it is sometimes difficult to get directly to the meat of the story you might want to write. To help fiction book authors combat the difficulty of coming up with great story ideas, Bill Platt developed his Fiction Plots program, where he now has 300 full-length plots in 70 different series, in 24 different sub-genres. Instead of filling his website with story plots written by amateurs, Bill hired published book authors to create story plots for his customers. And instead of telling them to write individual plots in specific genres, he instructed them to create plots for the kinds of stories they would want to read, but to focus their efforts on writing plots that could be used to develop a series of books. His vision was genius. His website is perhaps one of the best resources for fiction book authors available anywhere online. He offers four different subscription options, including: Monthly, Quarterly, Yearly and his “Platinum Subscription” plan that allows you to pay a one-time payment to give you unlimited access to the plots already available and those plots that will be added in the future. His “Platinum Subscription” plan is equal in cost to purchasing four years worth of access to his website. Should you choose this purchase option, be sure to use the coupon “nov2018″ (without the quotation marks) to get a 25% discount on that option. The coupon is only available through Dec 3rd 2018 at midnight PST. Bill Platt has been providing training and resources to book authors now for a number of years. In 2014, several of his customers asked if he could help assemble some fiction plots to help them with the development of their own stories. He hired a team of published book authors to write fiction plot sets for his customers. But instead of simply creating sets of ten plots within one genre, he instructed his writers to create a set of plots in a genre written in a series format. He told his writers to follow their gut and write plots for stories they would like to see told. He gave them general guidance about creating plots following a specific structure, but he didn’t interfere with their creative genius. So far, Bill’s writers have created over 300 full-length plots in 70 different series, in 24 different sub-genres. I have to tell you. This program is perhaps one of the very best resources on the internet designed to help fiction authors discover the stories they want to tell, and to guide the creative process in such a way that writers will be able to tell really outstanding stories that readers will love. Should you choose to give this program a spin, I strongly believe that you will be absolutely delighted with your purchase. When most people contemplate writing their first fiction book, they struggle to decide what story to tell. They don’t know what story they want to tell, and they worry that they will be able to deliver a story that readers feel is complete. After a certain amount of frustration, a lot of people will turn to the search engines to find websites that offer pre-written plots for them to use as the foundation for their own stories. There have been a number of people over the years who have developed packages of fiction plots people can buy. Most of the individual plot packages include ten plots that generally sell for anywhere from $15 to $50 per set. The people who sell these plot package typically provide ten (10) single plots within one specific genre. But the thing is that the people who do the best as a published author are those that write books in a series. Which is why what Bill Platt did was extraordinary. He hired a team of published book authors to write fiction plot sets for his customers. But instead of simply creating a set of ten plots within one genre, he instructed his writers to create a set of plots in a genre written in a series format. I talk to a lot of people who seek to write fiction stories. During those conversations, I eventually get around to asking how many stories they have written so far? I will be honest. I am often surprised at the number of people who have been studying the craft of writing fiction for years, who have yet to write their first story. I am curious person. When I hear about the fiction writer, who has never written any fiction, I ask questions. More often than not, people just say that they just don’t know where to begin. They don’t know which story to tackle first, and they don’t know how to get through the entire story without getting derailed. This is why I often recommend that people get started by getting their hands on some pre-written fiction plots to help them get over those initial hurdles. Bill Platt has created the ultimate resource for fiction writers with his Fiction Plots program. Very literally, this program is one of the best resources online for fiction writers. Over the course of the last four years, he has employed several published fiction authors to create some outstanding fiction plots to help writers find the story they want to tell and to give them a roadmap to follow when telling the story. This is an outstanding library of resources for the fiction author. His website contains over 300 full-length fiction plots, and you can purchase access to the entire library, by the month or year. With the “Platinum Subscription” package, you will gain access to the entire library of “what is” and “what will certainly be delivered in the future” for a one-time purchase price. With the coupon “nov2018″ (not including the quotation marks), you will be able to save 25% off the normal price of the “Platinum Subscription” plan. 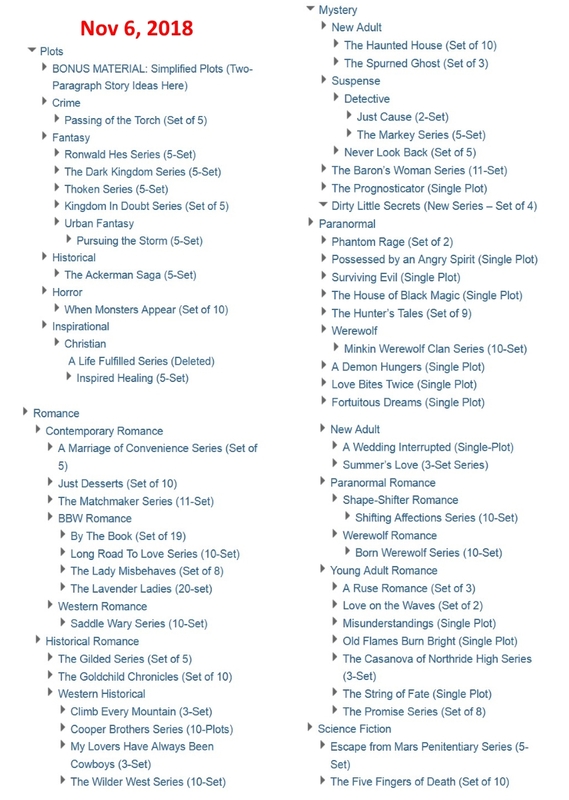 When you check out the sales page, you will be able to find a complete list of the Plot sets by name and genre, as well as an accurate count how many plots are in each series. The other unique aspect of this program is that not only is the website chock-full of full-length fiction plots created by published fiction authors, but most of the plots are written in a series format to help authors develop a series of books with the same set of characters.